3. Is this the correct pup for you, which is the best home and why? 4. Where do I get my pup from? 5. Which other breeds are most compatible with the Weimaraner? 6. Is it wise to have two or more of the same breed? 7. Do they get on well with other animals? 8. Training requirements and grooming. 11. Do`s and Don`ts of this breed. This breed goes back several centuries and is a descendant of the Bloodhound and it even appeared in a picture by the late artist, Van Dyck, way back in the early 1600’s. They were originally used as big game hunters, hunting animals such as wolves, buck and bears, and are good all round hunting dogs and pointers. Today, they are used as both bird dogs and water retrievers. They also do very well in tracking, pointing, police work, service dogs for disabled, agility as well as being used in search and rescue organizations. Weim, or Ghost Dog as it is often known, is a large, very athletic dog and has been bred for its working and hunting ability. This point should never be overlooked - the Weim is a working dog and requires plenty of exercise, and are most content when they have a purpose in life. Prerequisites for the dog’s wellbeing are high walls surrounding a good exercise area, and most importantly, lots of love and attention. This is not the breed to be kennelled and left alone all day. The Weimaraner will reward its owner with loyalty and grow from a boisterous puppy into a dog that will capture your heart, but remember, coupled with their intelligence is their ability to be demanding and strong-willed. They feel they are, and should be, part of the family, and if you are not prepared to devote time and effort to your dog, this is not the breed for you. They can be very good with children if they receive early socializing with them, but it is essential that the Weimaraner respects its owner and knows its place in the human/canine pack. They are very independent dogs and will constantly test your boundaries, so consistence with this breed is a must. As the Weimaraner is first and foremost a hunting dog, if they are not given an outlet for this energy, they can become destructive. Weim are not suited to first time dog owners, rather those that have experience with dogs. 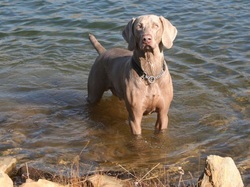 Although it is not common, especially with a dog that is worked and has a knowledgeable owner, Weims can be prone to separation anxiety, occurring more so in the dog that is excitable and highly strung. It would be a good idea to mention this to your breeder, and you will be given guidance and pointers to look out for to prevent this behaviour from happening. If however, you want a dog that is going to be part of your life, demanding affection yet repaying you with devotion and companionship this could be the breed for you. As with all other breeds, it is advisable to get your pup from a KUSA breeder, especially an accredited KUSA breeder if possible. A professional and responsible breeder will ensure that the pup is free from all genetic concerns, and make sure that the pup is well suited to you and your family. On average you will be interviewed by the breeder and then your name will be put on a waiting list for the next litter. Professional breeders do not mate ‘ad-lib’; they ensure that there is a market for their new offspring before mating occurs. They get on well with most other dogs, but not especially with the ‘Bull’ type of breeds i.e. Bull Terriers, Staffordshire Bull Terriers etc, and do not seem to socialize well with the Chow Chow and Akita breeds. Weims generally get on well with one another, but the male/female situation is always your best option. Never get two pups at once. If you do, the pups will bond more with one another than with the owner. Additionally you do give the dog the chance to develop its personality to the fullest by being an ‘only’ dog. If considering a second Weim, rather do all your puppy socialization and further training, and then consider another pup when the Weim is about 7/8 months of age. Remember that breeding is a science and should always be done by the professionals and that sterilization is responsible pet ownership. With regards to other pets in the home, such as cats, rabbits etc, as the Weim has the hunting urge, their natural instinct to hunt may be stimulated, so early socialization is essential and a careful eye must be kept on the relationship with smaller mammals. i. Training: The Weim is a strong willed and independent thinking dog as well as being very intelligent and a quick learner. Due to this training should be done in a firm and gentle manner. They will benefit from ongoing training and need daily exercise. As the breed is of the hunting variety, additional training and participation in retrieving and shooting events will ensure your Weim receives the stimulation it needs. Due to their intelligence, they can become bored easily if training is not varied. They are excellent protection dogs and it is advisable to do a lot of early and continued socialization to all types of people as they can be suspicious of strangers. The Weim has a short coat, and is an average shedder, and all that is required is a good brushing with a firm brush, once or twice a week to keep it looking sleek. Bathe in mild soap only when necessary. If working your Weim, inspect the feet and mouth carefully after each working session for any damage. Nails should be kept trimmed. Although this breed is known to be generally healthy, as with other breeds they do occasionally have health concerns and it is better to be aware of these and discuss same with your breeder. One of these is bloat so it is advisable to feed two or three meals a day rather than one large meal. They can also be prone to hip dysplasia and tumours. In some instances they can suffer from excessive rapid growth (hypertrophic osteodystrophy), so make sure you feed the best possible food. Discuss this with your breeder and vet. A professional breeder will only breed from excellent stock and do their utmost to ensure that your pup is as free from genetic disorders as possible and issue you with a health certificate. The average life expectancy for this breed is between 10 – 12 years. i. Do give your Weim plenty of exercise – daily. ii. Do have your Weim as part of the family. iii. Do provide consistent and gentle daily discipline. iv. Do expose to children and smaller pets, early socialization is a must. v. Do attend both puppy classes and further training. vi. Do continue further socialization. vii. Do work your dog in what he has been bred to do. viii. Do have high, secure fencing so your Weim cannot get out. ix. Do have a large sized garden/exercise area. x. Do give your dog the love, attention and companionship it needs. xi. Don’t have a Weim as an outside dog away from the family. xii. Don’t leave children and small pets unsupervised with your Weim. xiii. Don’t consider this dog is a first time dog owner.